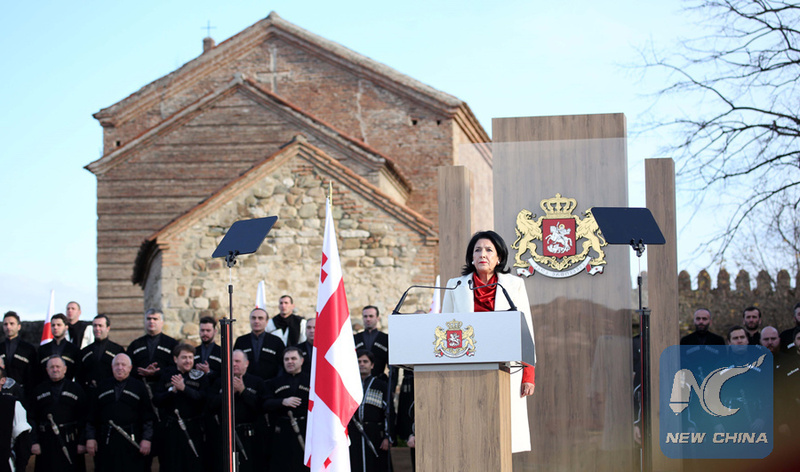 TBILISI, Dec. 16 (Xinhua) -- Salome Zurabishvili was sworn in on Sunday as Georgia's fifth president, also the country's first female president. "My goal is to do my best to develop our state, to make our European future irreversible and to prevent any obstacle in this process," said Zurabishvili, who promised to make the integration process with Europe a priority. Around 1,800 people took part in the ceremony, including 150 representatives from around 55 countries and international organizations. Zurabishvili, born in France in 1952, served as foreign minister of Georgia from 2004 to 2005. Georgia held its fifth presidential election on Oct. 28. As many as 19 candidates nominated by political parties and six independent candidates ran for the presidency. Zurabishvili won the presidency after a runoff. The election marked the last direct election to choose a head of state in Georgia. In the country's next presidential election, set for 2024, an electoral board of 300 lawmakers and regional officials will cast their votes to find a winner.